When I did my little Twitter survey a few weeks ago lots of you said you'd like to see some more lifestyle blog posts, and although this is technically baking I still thought it'd be a lovely post to put together! These aren't just any cupcakes, these are winter sun-dae cupcakes (see what I did there...?) For those of us in a desperate need for a sunny holiday! 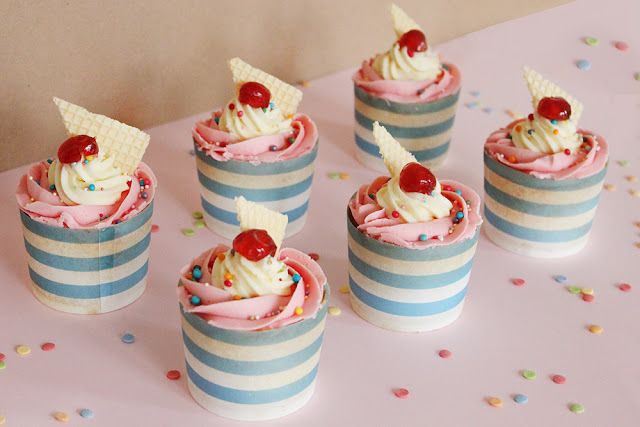 I can't promise everyone a beach holiday but I can give you this recipe to these cupcakes which look just like ice-cream sundaes! Now, I have a confession, just like my last baking blog post, I didn't make these as I cannot make a cupcake good as this. I collaborated with my friend and self taught baker Bryony who has the most gorgeous and mouth watering Instagram (which you can check out here!) Enjoy! Top tip – Make sure all of your ingredients are at room temperature; this will give you the best results! 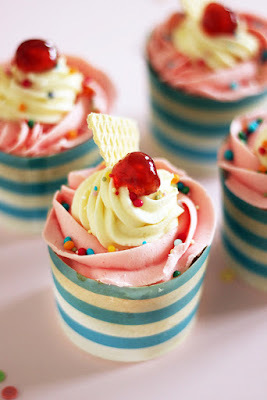 Preheat the oven to 170 C / Gas 3 and place your cupcake cases in your tray so they are ready to go. By hand or by using an electric mixer beat the butter for five minutes until soft. Slowly add the caster sugar into your mixer/bowl and mix up until light and fluffy. Pour in the vanilla extract and then add the eggs one by one - whizz again to make a yellow batter. Slowly add the flour and mix until it is smooth, you'll need to do this for about 5 minutes. The longer mixing time enables air to get into the mixture which will make the sponge lighter and fluffier. Spoon the mixture into the twelve cases until about 3/4 full. Now pop in the oven on the middle shelf for 20-25 minutes. 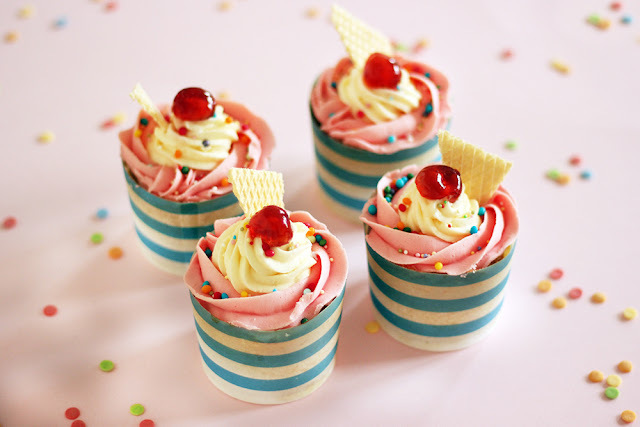 Remove the cupcakes from the oven after 15-20 minutes depending on your oven. You can check if they are ready by using a cocktail stick - it should come out clean. However keep an eye on them, you'll know when to take them out as they'll bounce back to the touch and the top will still look slightly sticky. Leave on a cooling rack for 30 minutes or until cool, then it's time to decorate! Beat the unsalted butter for around 5 minutes or until it's pale and fluffy. Add in the icing sugar using large spoonfuls. Add in a splash of milk if the mixture is too thick and dry, pop in the the vanilla extract then continue mixing until fluffy and well incorporated. Separate the buttercream into two medium bowls, in one bowl add a small amount of pink food colouring and mix well. 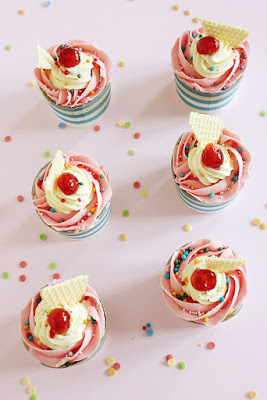 Place the pink icing sugar in one piping bag with a star nozzle. Fill a separate piping bag with a star nozzle with your vanilla buttercream that you set to one side. Pipe the pink buttercream on top of the cupcakes. Then carefully ice on top of this with a smaller amount of buttercream, so you get the effect of two flavours of ice cream! Now it's time to decorate! I've popped a glace cherry on top, and finished with sprinkles and a triangle of wafer. However you could always add chocolate sauce, fresh berries, a paper straw or even a chocolate flake! 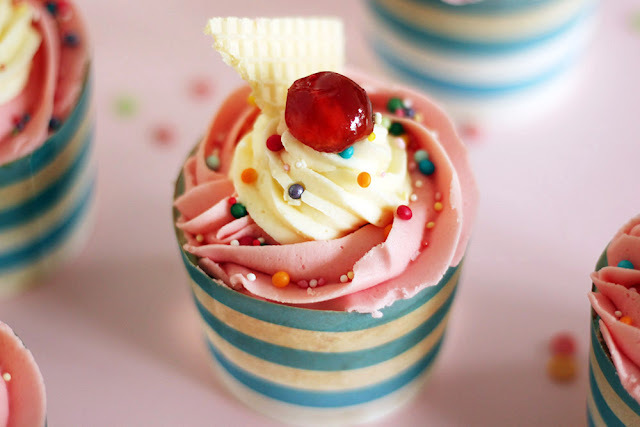 This is a very cute design for a cupcake! Your friend has a talent for piping! This is looking so cute and yummy ! Where are your cupcake cases from? I need them!